A good radiograph is an essential part of any Dental Diagnosis involving the hard tissue (Tooth or Bone) and getting an ideal radiograph is important to get a proper diagnosis. For an ideal Radiograph the following things should be satisfied – Good Density, Good Sharpness, Accurate positioning and Good Contrast, when all the above criteria are not fulfilled it results in a faulty radiograph which deters the diagnosis of the condition and can in turn result in the inability to decide on a proper treatment plan. Before we go into the various types of Radiographic faults, let us look at what the important aspects defining a good Radiograph actually mean as they directly affect the quality of the Radiograph and having a proper idea about each one is important. Density: This is the darkness or the black areas seen on the radiograph, the soft tissue or the lack of hard tissue can be identified by Black regions on the radiograph. The changes in kV alters the density of the radiograph – decrease in kV decreases the density making the radiograph lighter, while increase in kV increases the density making the radiograph darker. Contrast: It can be described as the degree of darkness on the radiograph, it is very important as it helps in identifying the borders. It is useful in seeing the PDL widening which cannot be visible if the contrast is too low or too high. Sharpness: This plays an important role in deciding if the x-ray is good or not, as sharpness defines the details in the x-ray which is useful in defining the borders and outlines of the teeth or restoration or extent of caries in the x-ray. 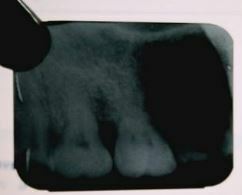 Foreshortening as the name suggests refers to images of teeth and other structures in the x-ray appear too short. Cause of Foreshortening: Due to excessive vertical angulation (too high) of the x- ray tube during taking the radiograph. This can make it difficult in certain cases like Endodontic treatment where the working length cannot be properly determined due to the difference in size of the tooth. Elongation refers to images of the teeth and surrounding structures appear longer than in real. Cause of Elongation: Due to decreased vertical angulation of the x-ray tube while capturing the x-ray. As seen in Foreshortening it will be leading to difficulty in getting the correct working length during Endodontic Treatment and other diagnostic procedures. This is not the same as Elongation as in this case only certain teeth are elongated while other teeth are normal or the same length as in real. Cause of Elongation of few teeth: Due to excessive bending of the film while placing the x-ray in the patient mouth. The region in which the x-ray is where the teeth or supporting structures are elongated. To prevent this from happening the film should not bent excessively only a gentle bend must be given to the film just for confirming to the anatomical contour of the intraoral structures such as the palate and the floor of the mouth. There is also a chance for bending of the film when canine -premolar areas are radiographed due to the contour of the palate. This results from improper horizontal angulation. 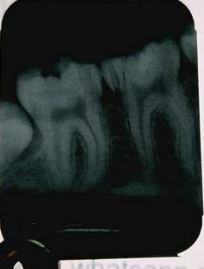 Overlapping of proxmial surfaces makes the x-ray impractical in cases such as proximal caries. Cause of overlapping: The xray is placed either too forward or too backward in respect to the x-ray beam. In an ideal radiograph, the occlusal plane should be parallel to the margin of the film while in this case the occlusal surface is slanting or at an angle to the margins. Cause of Slanting of occlusal plane: It results from improper placement of the film in the patient’s mouth. Sometimes the occlusal portion of the teeth is cut off due to improper placement of the film in the patient’s mouth while capturing the x-ray. To prevent this from happening, sufficient area of the x-ray film should be visible between the incisal or occlusal plane and the margin of the film. This makes sure that whole of the occlusal or incisal surface is recorded in the x-ray. The periapical region of the required tooth may not be recorded or visible completely. The complete periapical region should be visible in the radiograph for better diagnostic use. Cause: The periapical region is cut off when the film is not placed properly covering the apical region in the patient’s mouth. Blured or distorted image refers to an image which is hazy or blur and without any sharpness preventing us from differentiating adjacent structures. Cause: Blurred or distorted x-ray is either due to the movement of the patient or the x-ray tube during exposure. Cone cut appearance refers to a clear, unexposed area in a dental radiograph. The other region of the X-ray is clear with the structures seen clearly. Cause: This results from the x-ray beam not positioned perpendicular over the film. The term phalangioma was used by Dr. David F Mitchell. It refers to the image of phalanx or fingers (plural -phalanges) appearing in the film. Cause: Phalangioma occurs when the patient holds the film in the mouth in an incorrect way which results in exposing the image of fingers on the radiograph. It is important to note that holding the x-ray with fingers while the exposure is not advisable as per radiation protection protocols. Double exposure or double image refers to the appearance of two separate images in the radiograph. Cause: Double exposure or double image appears due to repeated exposed film. Reversed film refers to a film exposed from opposite side. It is the decrease in the amount of x-ray beam exposing the film. This results in light images with herringbone or Tyre track or car – Tyre appearance in the radiograph. This pattern is due to the embossed pattern in lead foil at which the x-ray beam is exposed. Cause: If the Film is placed in the mouth reversed and then exposed, the x-ray beam gets attenuated by the lead foil backing in the film packet. Film creasing can result either in cracking of emulsion or a thin radiolucent line appears in the radiograph. Crimp marks or nail like curved dark lines results from sharp bending of the film while placing the film in the patient mouth. A light image is the lack of proper contrast. A decrease in the exposure time, mA, or kVp results in a light image. Apart from the Decrease in these factors, certain processing errors can also result in light image which will be explained in a later post. It is just the opposite of a light image as the dark image results from excessive exposure time, mA, or kVp. Apart from these factors, certain processing parameters can also result in dark image. I am Reshma , final year BDS student.This post was really helpful.Thank you sir. Its usually the other way around, a CT is done to check if there was something missed from a Pano.